the first thing I accomplish when I tie up a bridle is to make 4 identical leaders that will be the attachment points at the leading edge. I make these with 3 knots that are approximately 1.5cm apart. For this kite, I've used white, 150lb bridle line. cut off a significant portion of the line... 75cm should do the trick, but I like to tie up a test lead before I cut the line. (I leave myself way more than enough so I can cut off the extra). 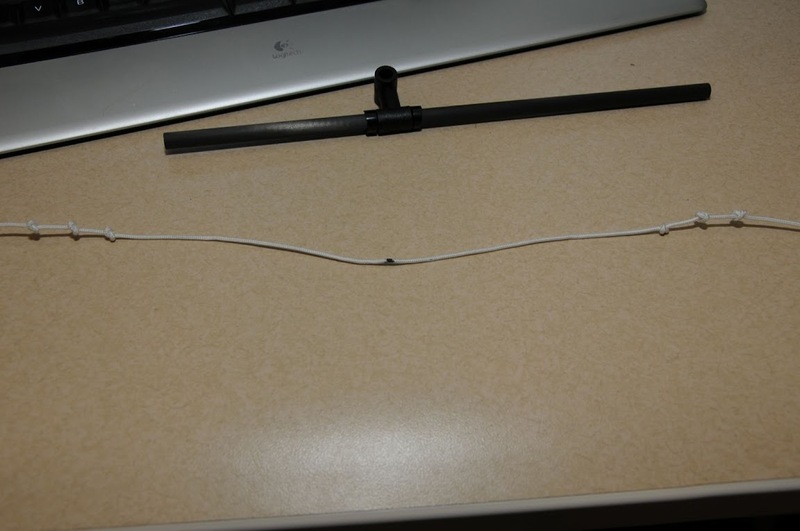 Fold the strand in half. I don't always use a double thickness lead, but for this kite I decided to go for extra heavy duty. 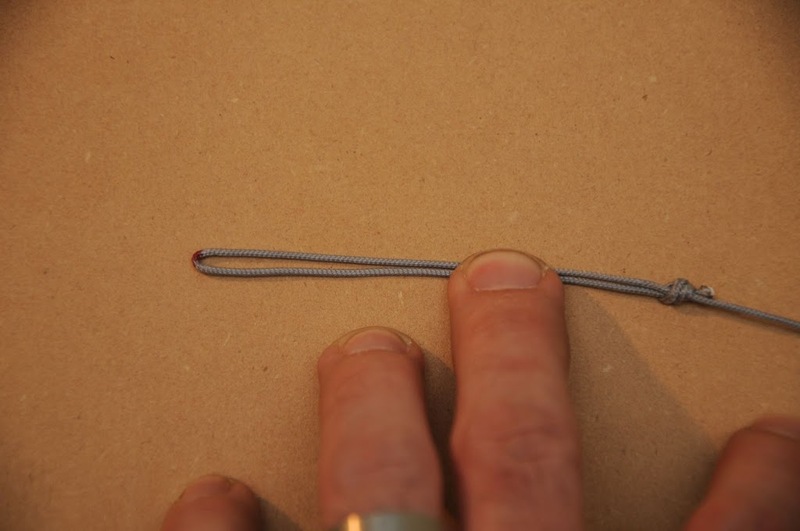 Then tie a knot leaving a loop of 8cm. 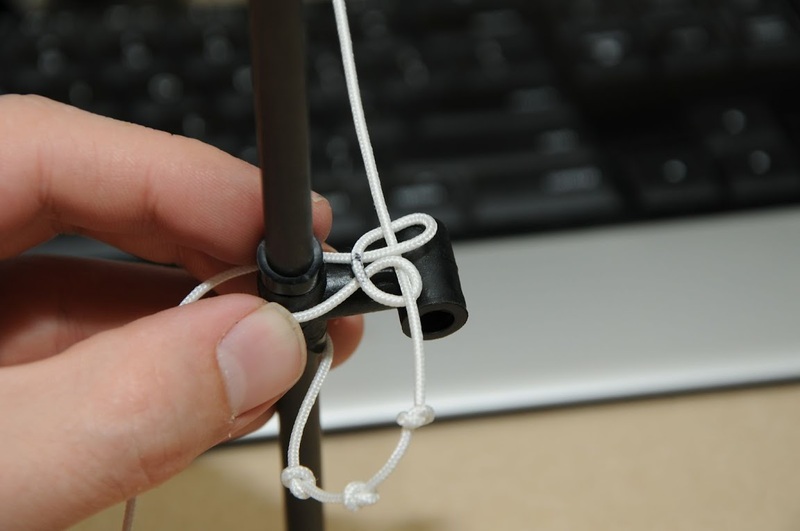 (use an overhand knot as discussed in the previous post). 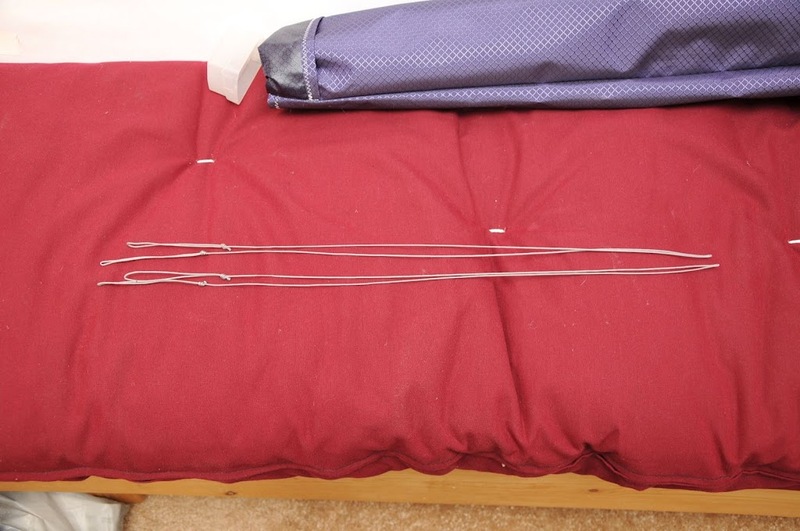 The knot will be the first tie point for the bridle leg so be accurate with your loop on all 4 leads. 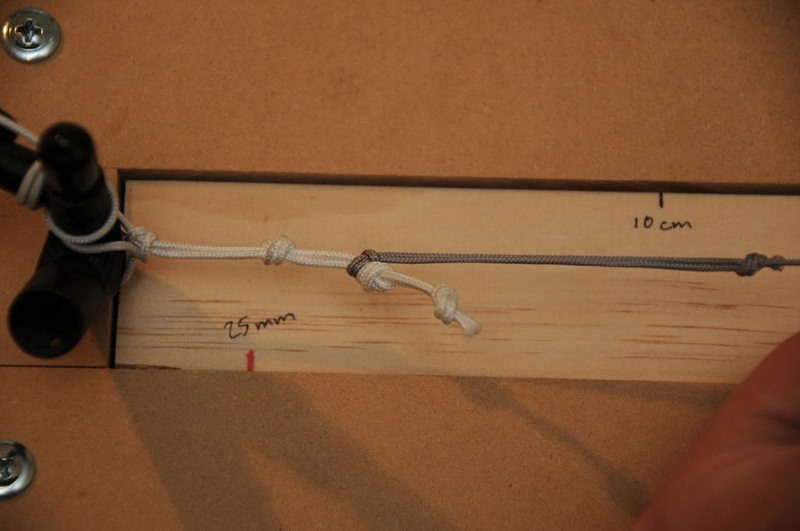 Now tie 2 more overhand knots in the lead 1.5cm past the first, and then 1.5cm past the second. 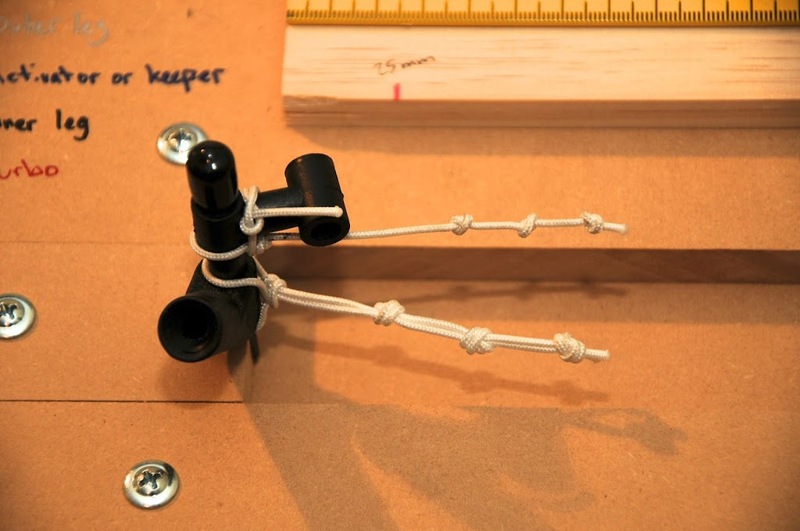 The exact position of the knots will be important later, as the length of the lead will need to be subtracted from the plan's given length for each leg. My intent is for the bridle legs to equal the length in the plan when positioned on the middle knot. This will give me one longer and one shorter length to play with when I start to fly the kite. 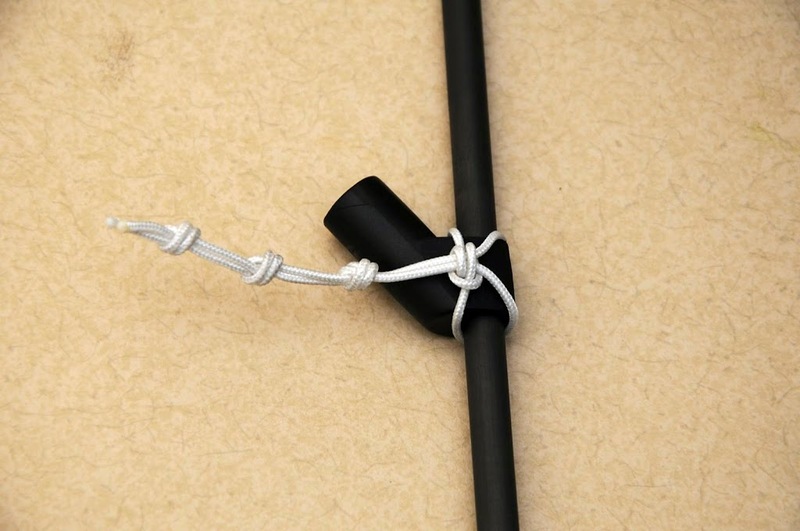 Now tie up 3 more leads that are exactly like this one. Now bring the knotted portion of the lead back through the larks head toward the middle of the kite. 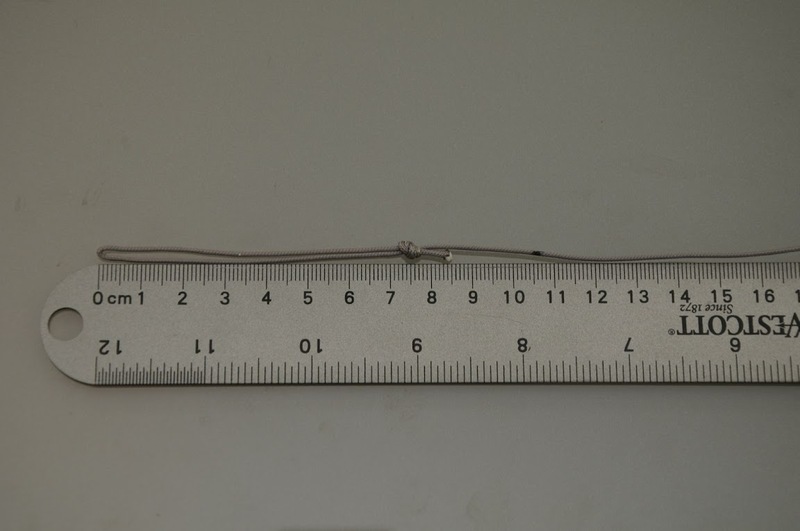 The reason the original loop was made at 8cm is because this is about as small as I could make it and still get the lead tied to the frame in this fashion! 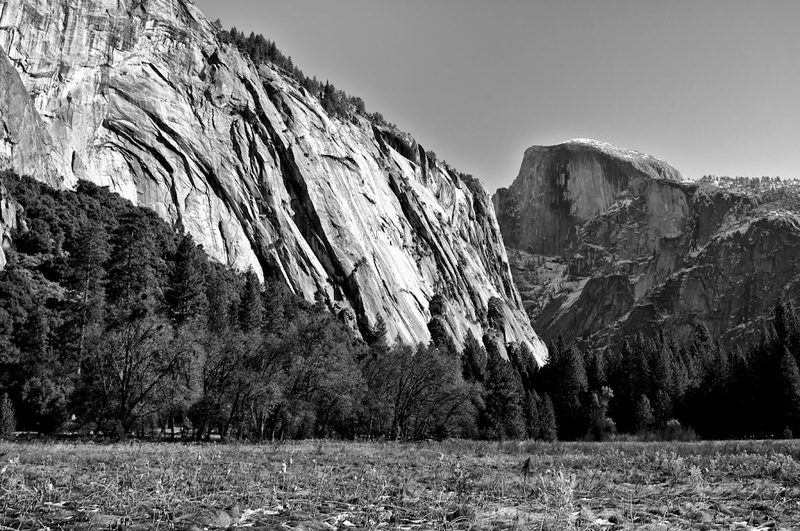 with all the knots threaded through the lark's head, tight up the knot so that it is neat. Repeat this at all 4 leading edge connectors. The center T will be done a bit differently, so I'll post that process next. note that the center is marked with a Sharpie and that I have rigged up a demo spine for the purpose of this documentation. The larks head knot will sit on the top of the center T on the front side of the kite; bear with me. Note also that the individual ends of the lead are split by the spine at this point... one on each side. Starting with one lead, it will come past the side of the T piece, around the back of the spine, and back under the front of the T (to return to where you started). Thread the first lead through the Larks head as pictured... it will end up pointing in to the opposite side of where you started. Through this process, make sure you maintain the position of your center mark. This is important for symmetry at the end of this processes. 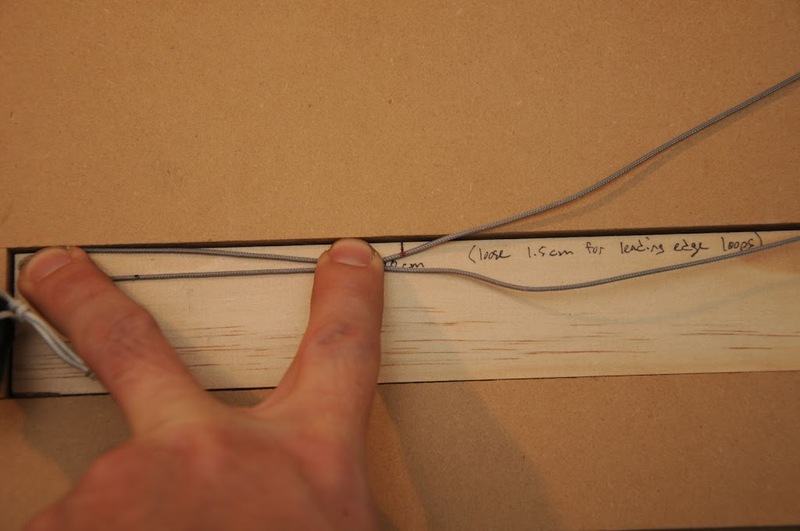 Repeat the wrapping with the second lead in the same manor (on the other side of the spine). It should thread through in the opposite direction of the first half. Once both leads have been threaded through the larks head, tighten up the knot so that the sides remain equal in length. The end should look like this. 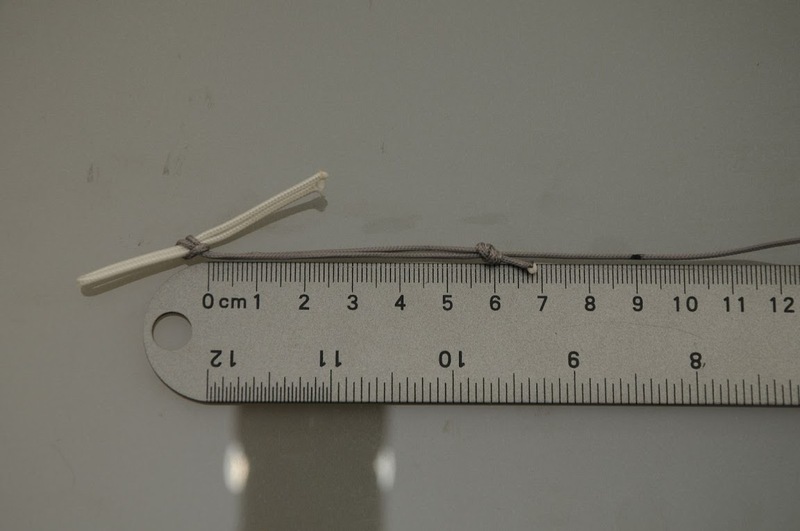 The end, pictured again here has knots placed at 3.5cm, 5cm and 6.5cm. These measurements are important, as they will be the adjustment points for the inner leg of the bridle. I will measure the bridle to be at the dimensions the plan calls for when it rests on the middle knot... giving me 1.5cm of adjustment in either direction. Remember that the larks head is on the top of the center T as the plans have called for. Many kites have the inner leg attachment below the center T, so make sure you double check the orientation to match the plans. ok. lets look at the bridle itself. When preparing to build the bridle, it's important to make a few decisions. Typically, I like to sew the loops in my bridle. 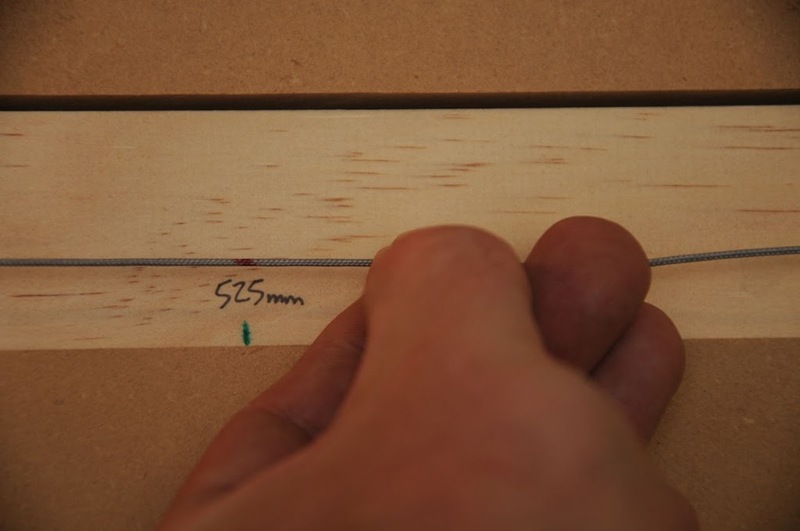 The reason for this is the ease of measuring... the length of bridle line is not shortened by tying nots. 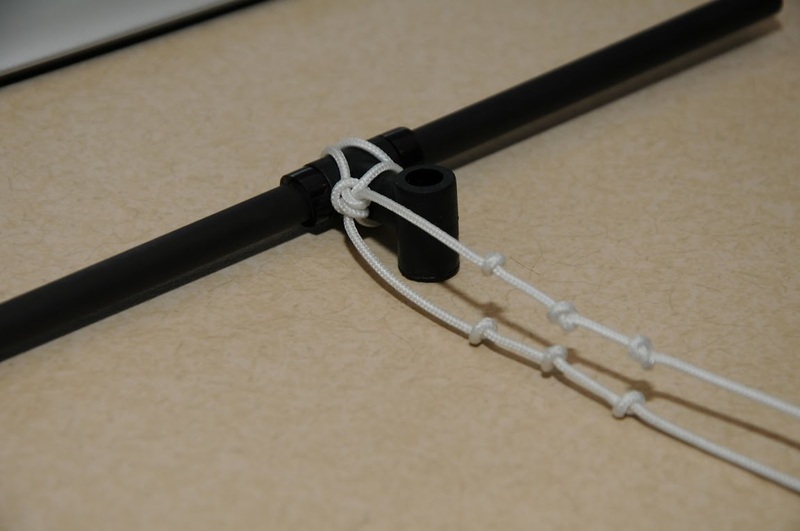 For the B'zar build, I've decided to tie up the bridle using the knots discussed in previous posts. 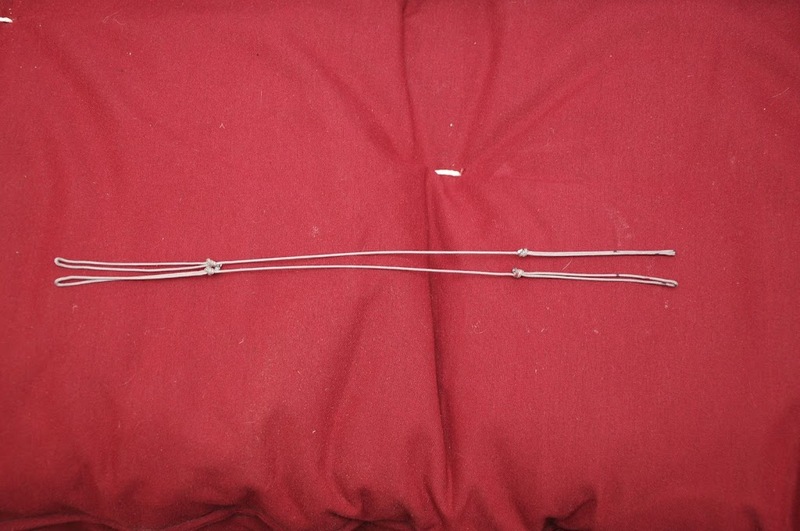 To start, developing a standard for your bridles is important for repeatability and accuracy. 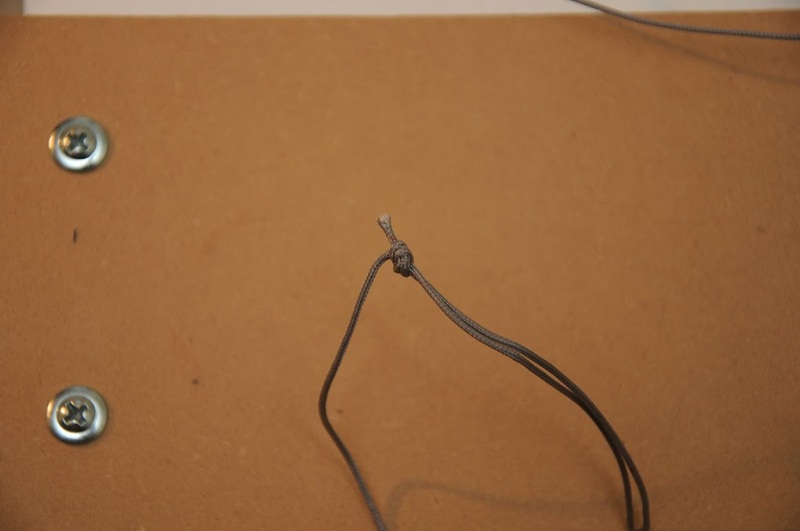 For the ends of each leg of the bridle, I always make a loop with an overhand knot. 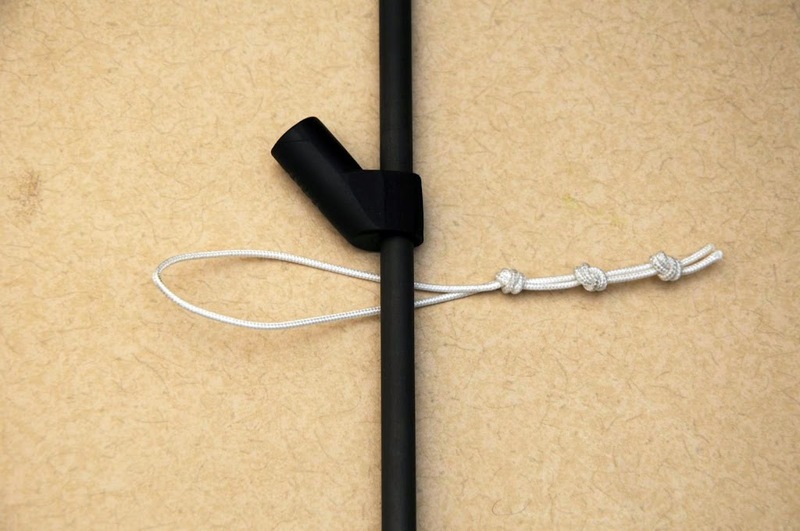 I fold over 10cm of bridle and tie the overhand knot as close to the end as possible (for the largest possible loop with a 10cm fold over). 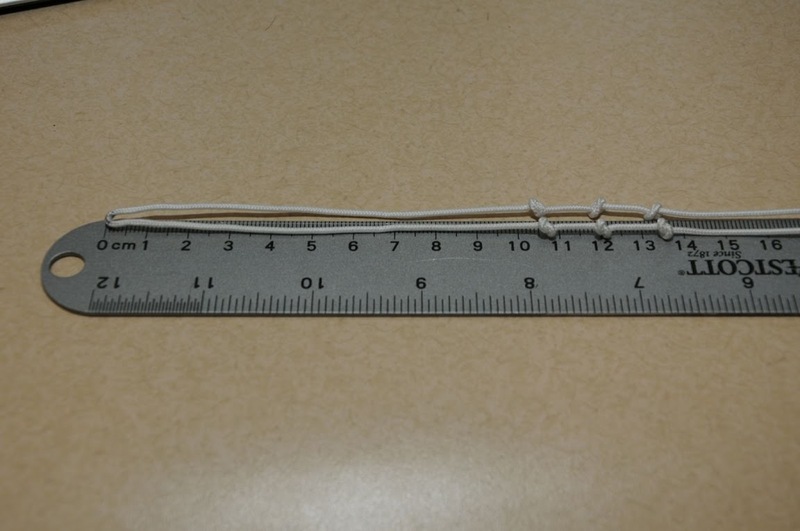 As I mentioned, I fold over 10cm, but I mark the line at 12cm in order to measure how much length is lost to knots. After I tie the knot, I see how far the original mark has moved... in this case I have lost approx 1.5cm of length by tying the knot. 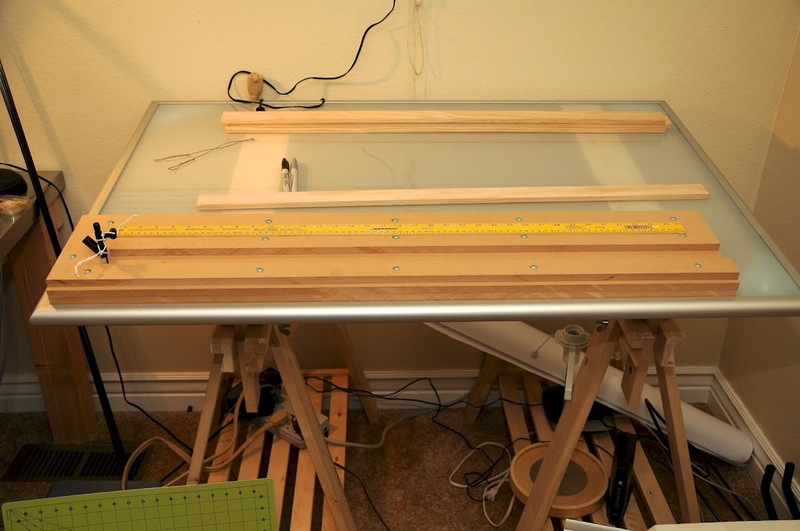 (note that I have not cut off any bridle line from my spool... I will do this once I have figured out how long to make the first portion). 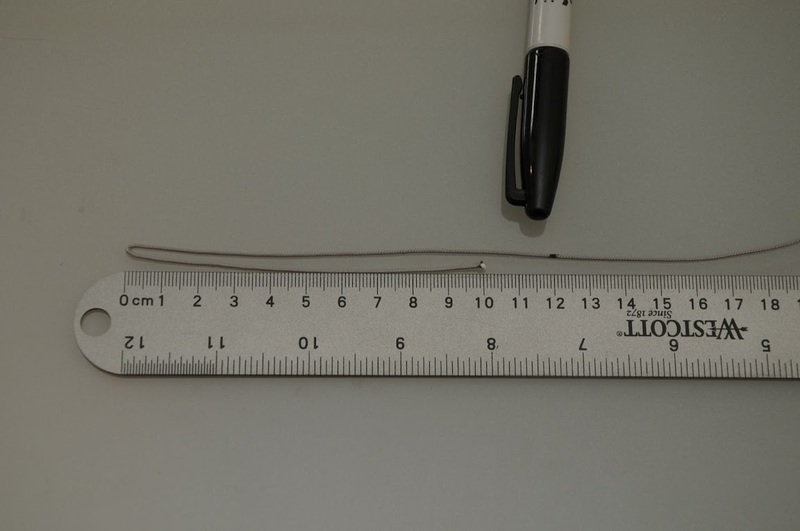 Now, the final requirement to calculate your length is to tie a larks head knot around a test lead and measure how much is lost from the original mark. 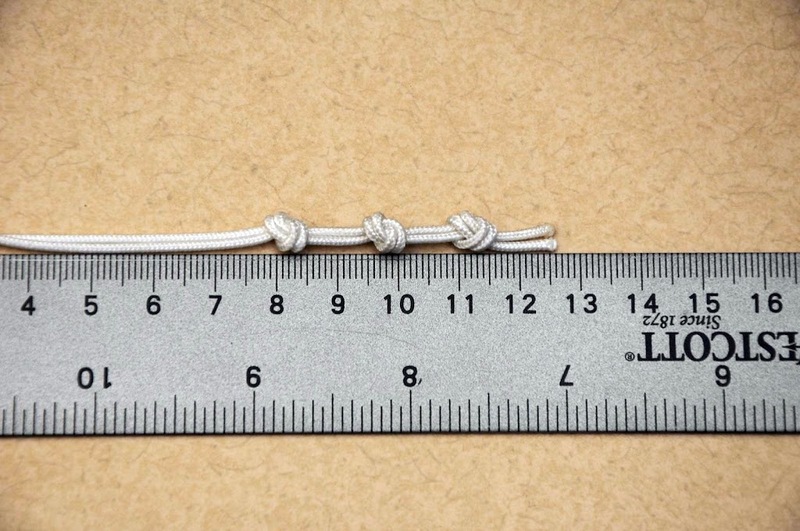 The final amount lost from the original length (at the fold, before any knots are tied) is 3cm... see that the mark is at 9cm. If this is getting complicated, hold on. I can make it harder yet. OK. So now, to make it even worse, I make my outhauls out of one length of brilde line... upper leg and outer leg = one piece. So stay tuned for additional images. Don't start making your own bridle 'til I post a few more threads. Company just arrived, so I'll get back to it later this evening. Thanks for all the details on the bridle. I love how you are making it so adjustable. I'm definitely going to use some of these ideas in my Vortex build. 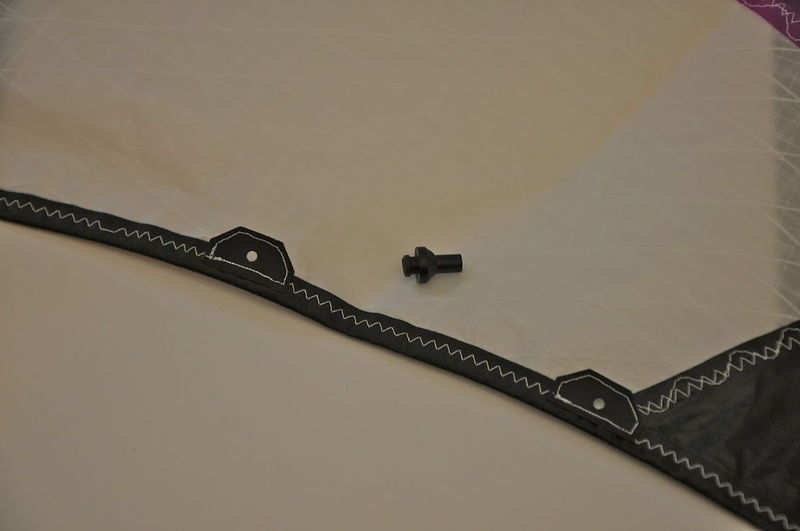 BTW, while following the steps you have on making the tail strap for the spine, I found an error in your description. The photos show the correct length, but the text is incorrect. It says to cut the Dacron to 7.5 inches. 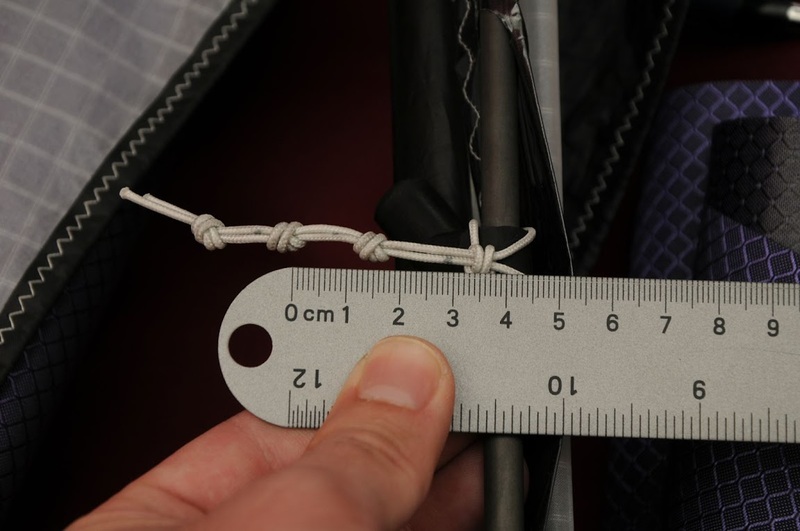 If you do that and fold the .5in flap then fold the remaining strap in half as shown and described, you end up with a 3.5in strap. Now the 2in hook and loop pieces won't fit. I believe you meant to say cut a Dacron strip 14.5in long. That is what is shown in the pictures, and the math works correctly on it as well. I found an error in your description. The photos show the correct length, but the text is incorrect. It says to cut the Dacron to 7.5 inches. 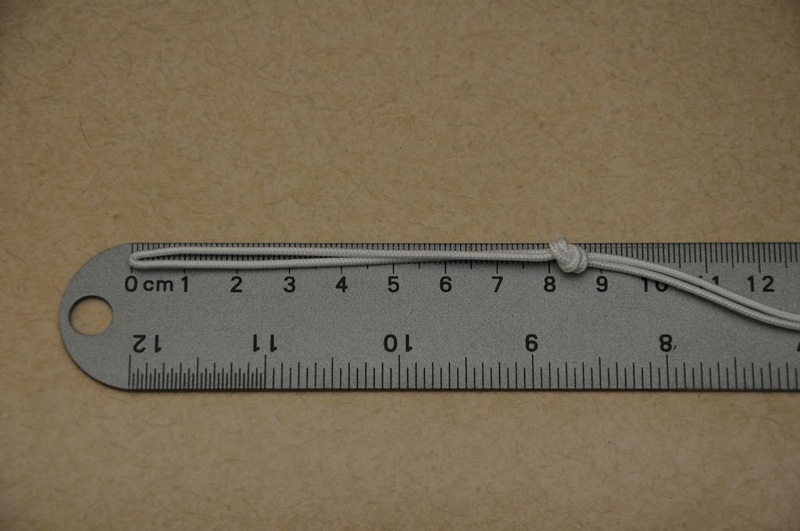 If you do that and fold the .5in flap then fold the remaining strap in half as shown and described, you end up with a 3.5in strap. Now the 2in hook and loop pieces won't fit. I believe you meant to say cut a Dacron strip 14.5in long. That is what is shown in the pictures, and the math works correctly on it as well. error noted and corrected; thanks for the heads up. Then I cut the hole for the standoff. I cut a hole slightly smaller than the post on the standoff connector... and then use a hot cutter to melt the edge of the hole to a size that the standoff connector will fit in (snuggly). Here is a picture taken prior to melting the holes to there larger size. That pretty much does it for the sail portion of this kite build. In the next thread, I'll talk about how I prep and build my frame. 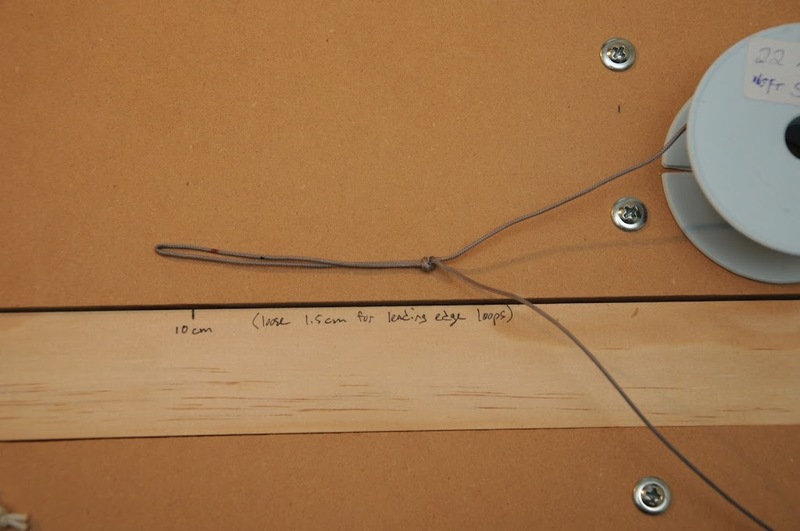 Also, keep an eye out in the Kite Building and Repair forum for a new thread that will cover the kite sleeve construction (I'll be starting it soon). Sorry to pull up an older page but I am going to be doing this step fairly soon. How do you determine how far off the TE to place the holes? fell a little behind on what I had hoped to document. A quick entry before I go to work today. 5: green = outer and upper legs (upper and lower outhaul). This is one piece. Stay tuned. I have 5 twelve hour shifts in a row starting today, so I won't be posting anymore until middle of next week. 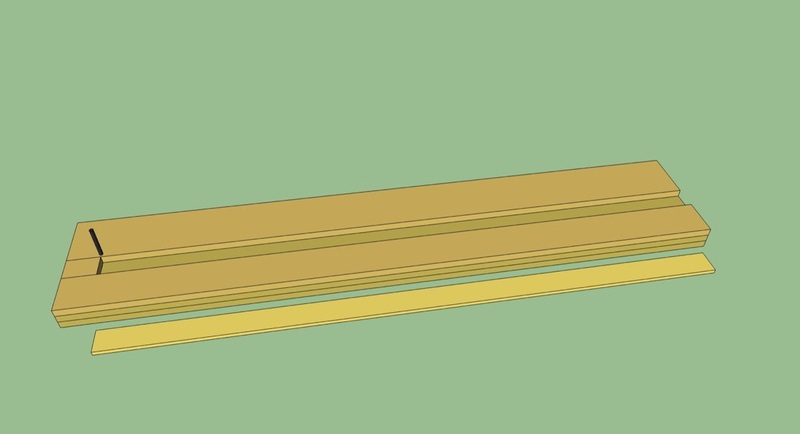 for the standoff reinforcements, my preference is to put them under the trailing edge strip, and then I put the holes in a way that they will not sever the trailing edge seam. I'll be posting better documentation of this on my P2 build, but not until a week or two away. I am out the door now, but can post more detail later. Hmm i noticed on your bridle the leg going from the upper le point to the inhaul you have as an activator. Are you deviating from the plans on this? Usually that is just a keeper line to stop tail wraps and if you make that active you can really screw up how the bridle functions and how the kite performs if its not done right. The plan does call for an activator rather than a keeper line. I verified this with positivo because I wondered the same thing. I've delayed these last posts because I was unhappy with the photographs of my bridle build. I'm going to completely rebuild my bridle (first one will be saved for a future B'zar build) for the purpose of better documentation. To go along with this, I'm going to be building a new bridle board that will be beneficial for future builds of many different kites (will explain later). So, look for more posts starting tomorrow... hopefully to be finishing up this thread by the end of this week (or next). as mentioned, I'm redoing my bridle for the purpose of documenting accurately, and in order to make this applicable to future kite builds. 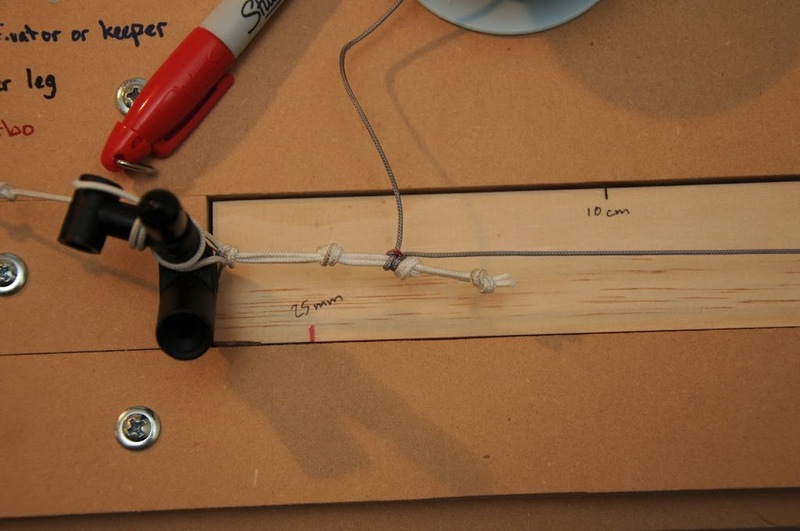 My original intent was to show how I figure the dimensions for a bridle, how much length is lost to knots, etc. (as started in the previous post). While this information is helpful, what I'm going for now is a method in which less math is involved and more building is taking place. 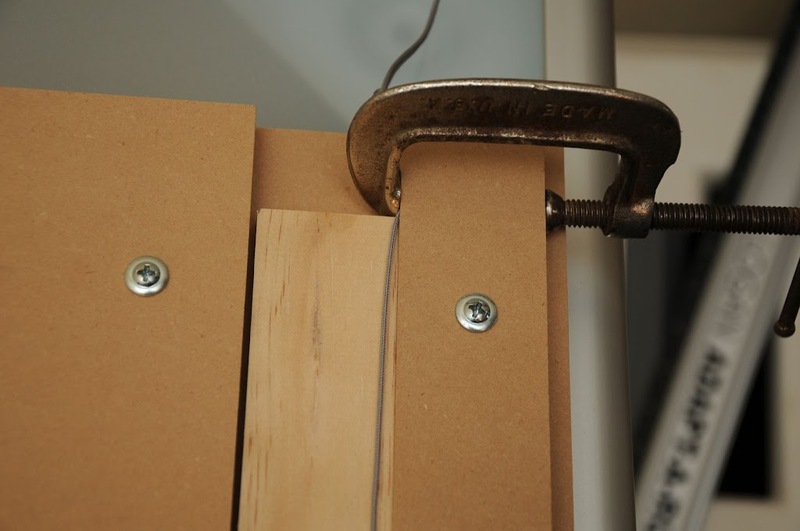 To do this, I'm building a bridle board of my own design. Tomorrow I'll put in an entry that covers most of this build with pics. 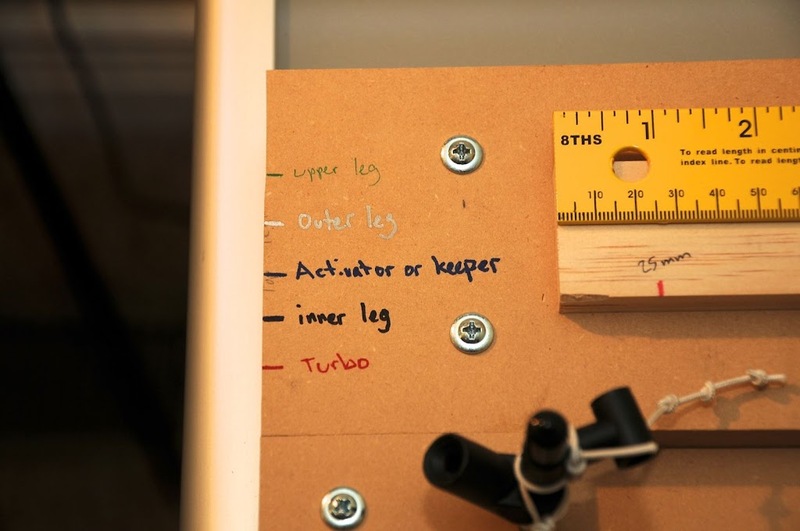 It is not a complicated design, and if you decide to build one, it can be done any number of ways to accomplish the same thing; so detailed documentation of the bridle board build will not be presented here. Construction of the bridle will commence later in the week as I put this new jig to use. (and I'll warn you now that I will be implementing not just a metallic and black colored sharpie, but colors such as green and red! so look out). so, as promised, bridle documentation commences. With this bridle board I've built, it's still important to know how much length is lost to tying an overhand loop and lark's heads and prusik knots, so I've left the previous post in about measuring the loss. Less math will be involved now, as we won't have to subtract the leading edge attachment leads from our final length... you'll see. for the template, I've used a measuring rule and marked (and labels with lengths) the measurements for the B'zar bridle. Note that they are in different colors. I've written a key for the colors directly on the bridle board that will be consistent with future builds. Only the measurements will change. at the top of my template, I've placed a 10cm mark. 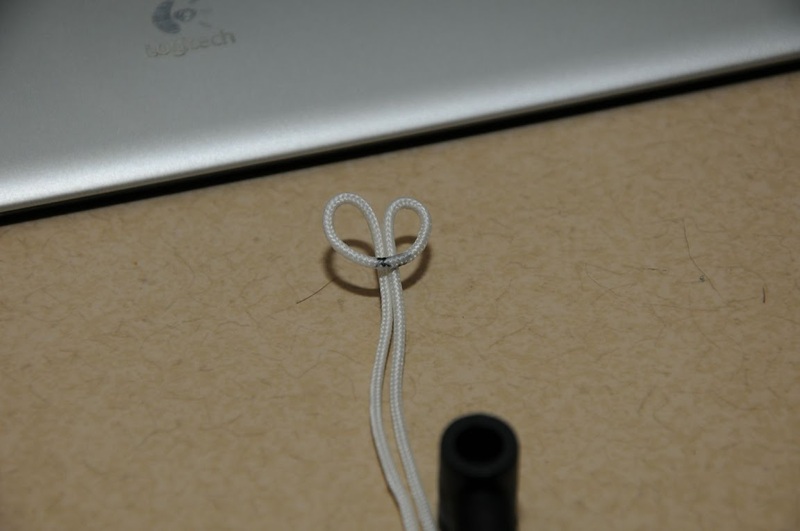 I almost always make my loops by folding back a 10cm length at the end of the bridle line and tying an overhand knot. Each portion of the bridle starts this way. something to note is the red mark... it will become the end of the line once folded and tied. Sometimes I do not mark the first one, I just hold my thumb nail at the correct spot and make a fold. 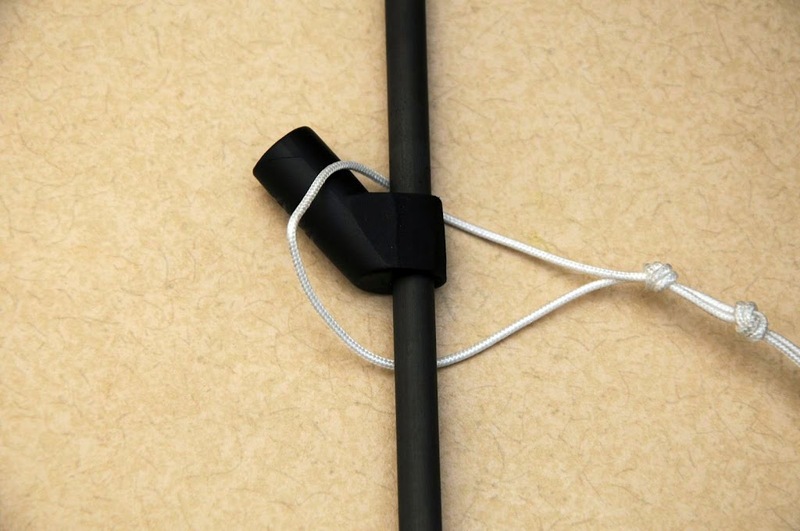 The bridle line is pretty easy to hold a folded point while tying it off. Now, these are the beginning steps for every potion of the build (I realize I'm mentioning this twice, but repetition helps with understanding). This particular potion I'm picturing happen to be the Upper leg and the outer leg (I'm not going to cover much terminology here... I assume everyone will know that this could also be referred to as the lower and upper outhauls). I almost always build the upper and outer legs as one portion of line. This is the upper leg portion, so I bring the line taught and make a mark at the 525mm mark (the mark is red, but this doesn't matter). now, not pictured terribly well here, I take the line off the attachment portion of the jig, flip it around, line the red mark up with the 545mm mark (length for the outer leg) and I clamp the original looped end at the end of the bridle board so that the mark still lines up with the 545mm mark when taught. Now, at the APA end of the jig, I tie a larks head so that there is enough tension on the line to hold this portion up (remember it is clamped at the other end). This takes a little practice, but can be done fairly easy. 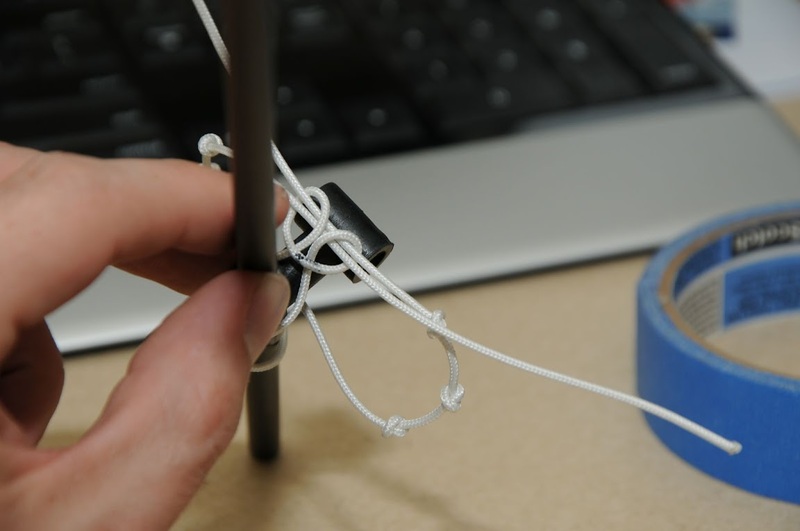 I then mark the line at the center of the knot (see picture). 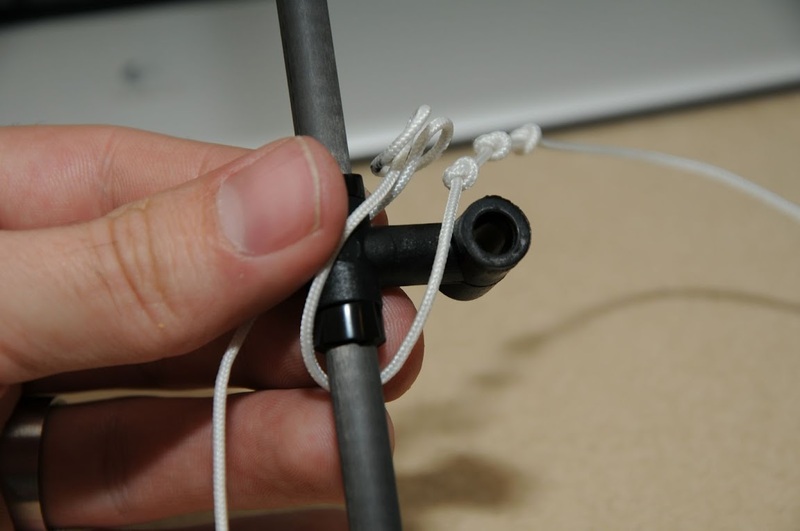 Remember though, this is not the mark where you will fold to tie your loop! 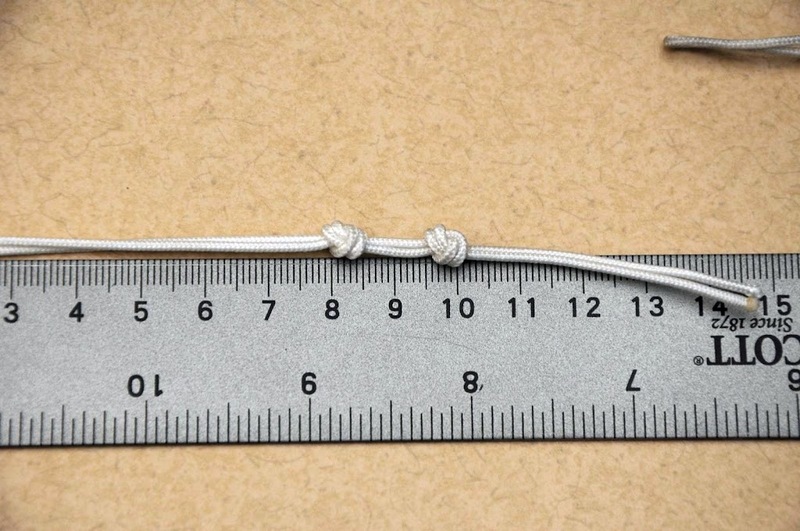 If you remember previously, you have to add 1.5cm past this mark to account for the line used in the overhand knot. now, I accidentally skipped a step in the photos. 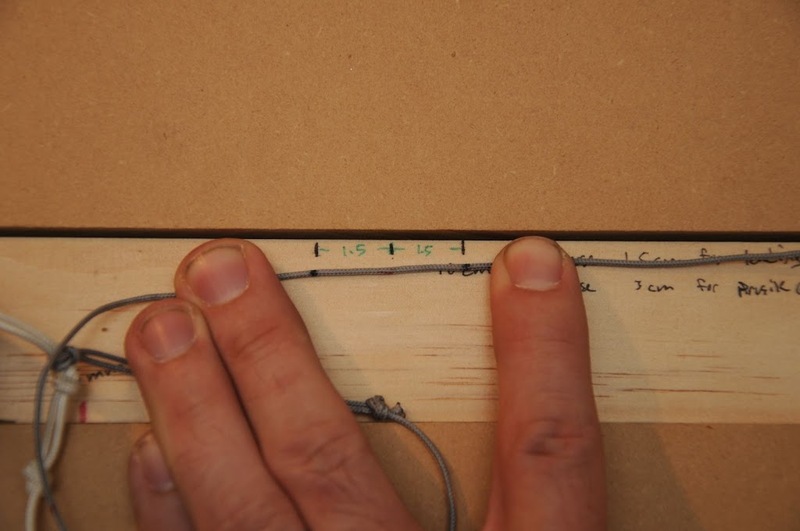 The important thing to note is that you need to loosen the line by 1.5cm and make another mark to compensate for the knot that will be tied to form the loop. 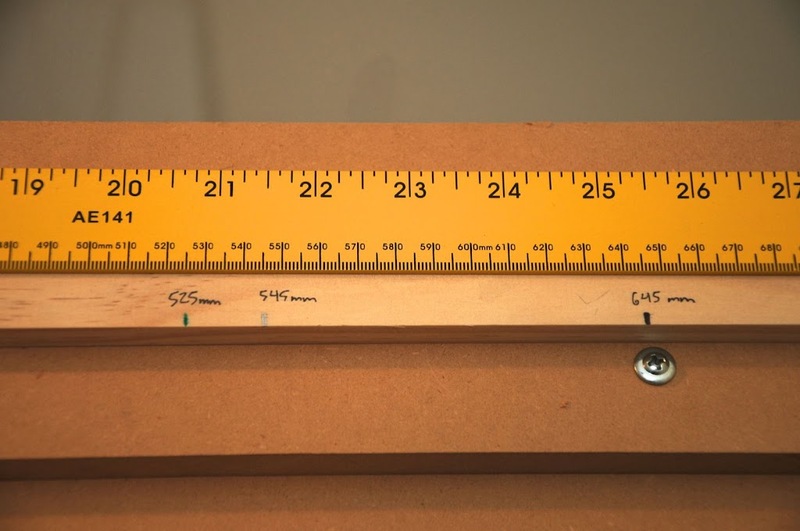 at that second line (looser, or closer to the spool; yes the spool is still attached), make a fold and measure out 10 more centimeters. Make a final mark at the end. 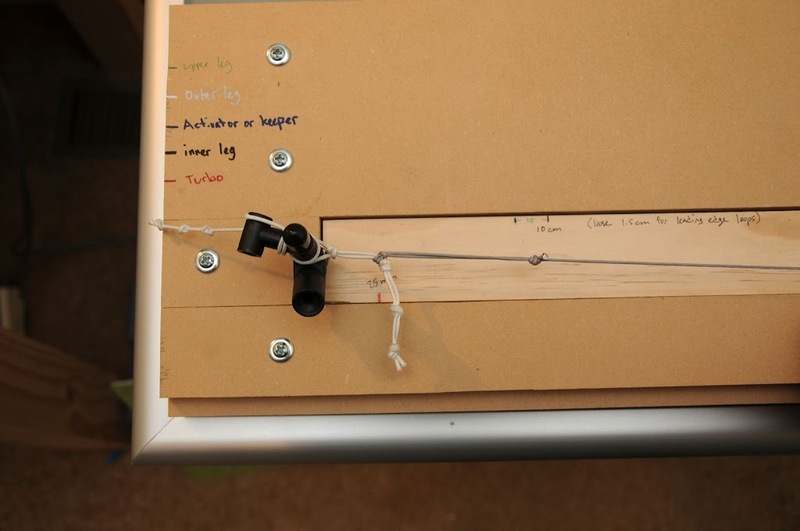 In this picture, you can see that I've added a note to the template to loosen (my short version "loose) the line by 1.5cm for the leading edge loop knots. I then made the mark at what will be the final knot. Remember, the spool is still attached and sitting just to the upper right of this photo. 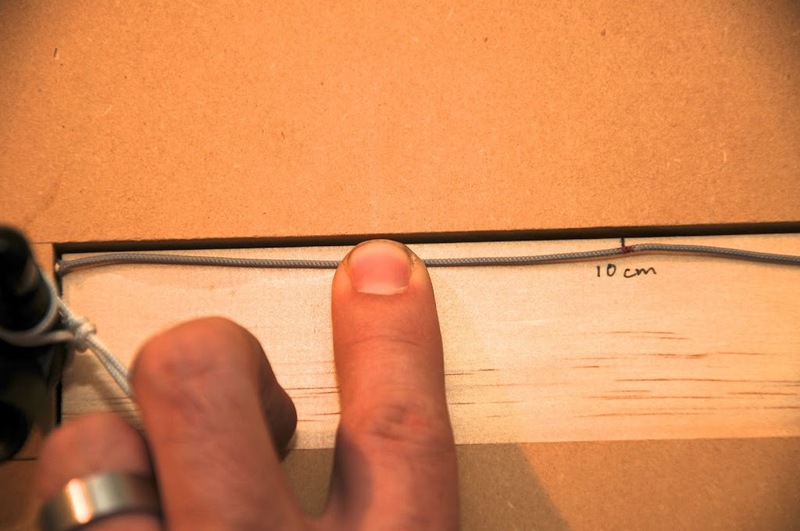 Now, with the line folded over at 1.5cm longer than the original red mark, and tied off at the indicated place of 10cm, you can cut the line from the spool. I cut about 5mm away from the knot, and melt it back. (melted portion not pictured). Now, I've one Upper and Outer leg assembly. Repeat this portion. (remember, your bridle is identical side to side, so you have to do two of everything). Once you have two of these, lay them out and be sure they are the same length. fold them at the mark you made to indicate the separation between upper and outer legs (which will also be the attachment point for the turbo portion of the bridle). The upper and outer legs are only a few centimeters different, it should be reflected at this point though. now time to move on to the turbo, inner leg and activator portions. 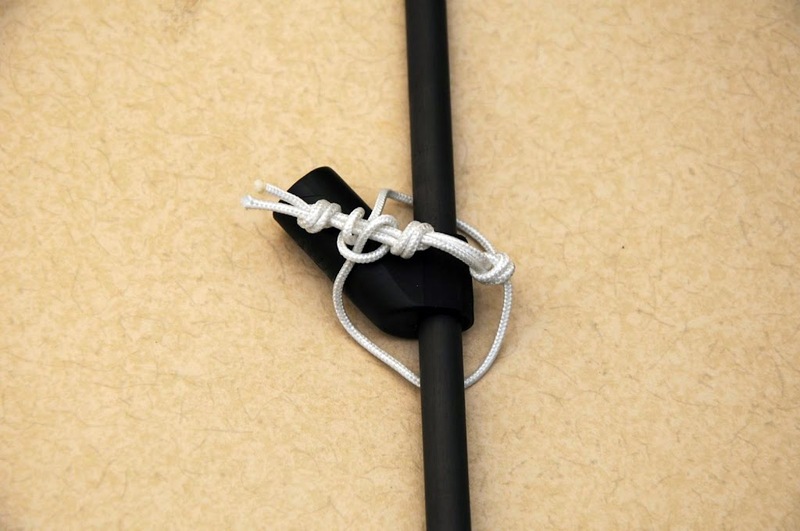 now, the activator is constructed in almost the same way, but the biggest thing to remember is this: My activator will not rest on the middle knot of the LE attachment point. I'll be using the knot closest to the spar. That being said, I may also play around with adjusting the activator... the reason for using the closest knot is that I only only foresee wanting to lengthen the activator (I know this from my first bridle build, as the activator does put quite a lot of influence on the inner leg with the dimensions the plan calls for). 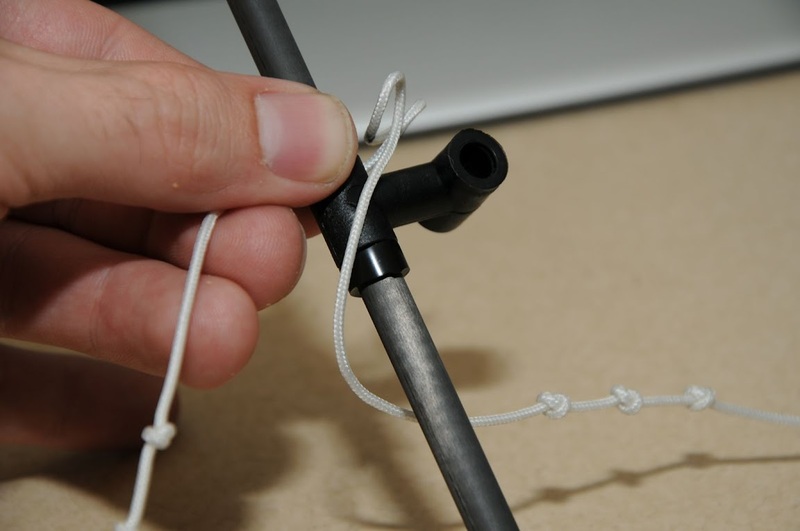 So, start with a 10cm overhand loop. Then attach to the jig. (also note that in this picture, I added the 1.5cm mark at the top of the template). Now, I bring the line taught and make a mark at the 316mm spot on the template, indicating what needs to be the final length of the activator. 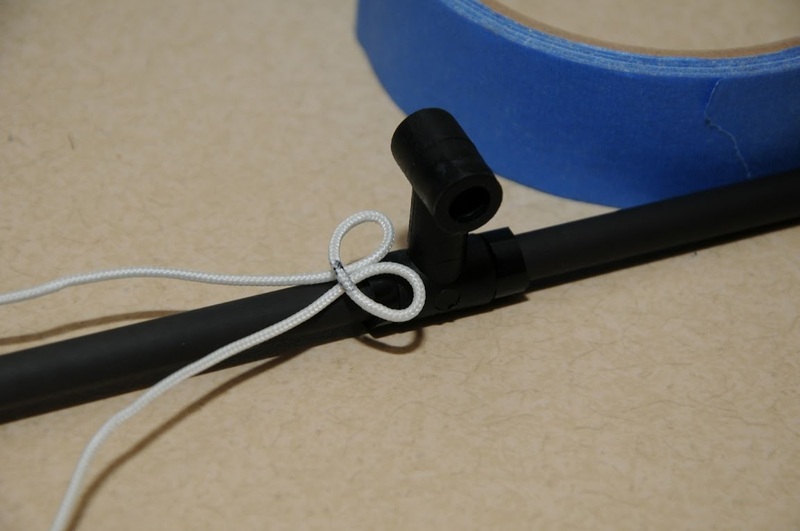 now, with this portion, I'm not attaching to a spar... it will attach to the inner leg with a prusik knot (or a sheet bend, but I'm planning for a prusik for easier adjustability). 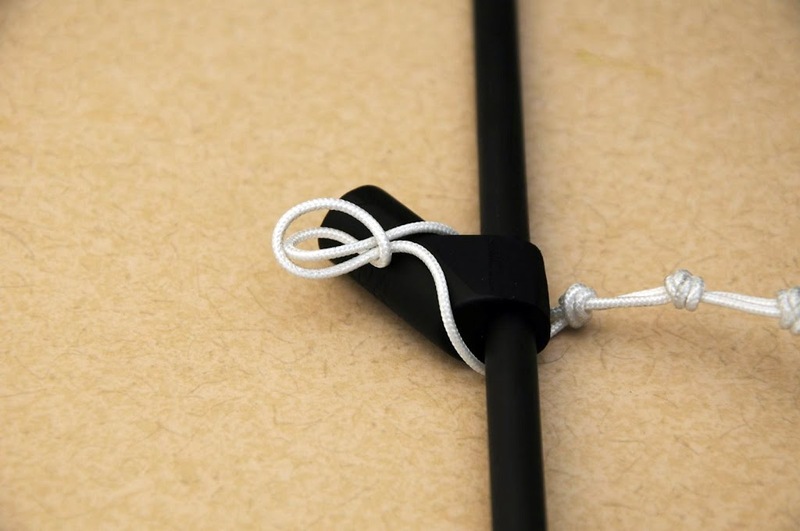 The previous method of tying the knot, marking the center and adding 1.5cm can work, but you'll need and extra hand to hold the line taught. 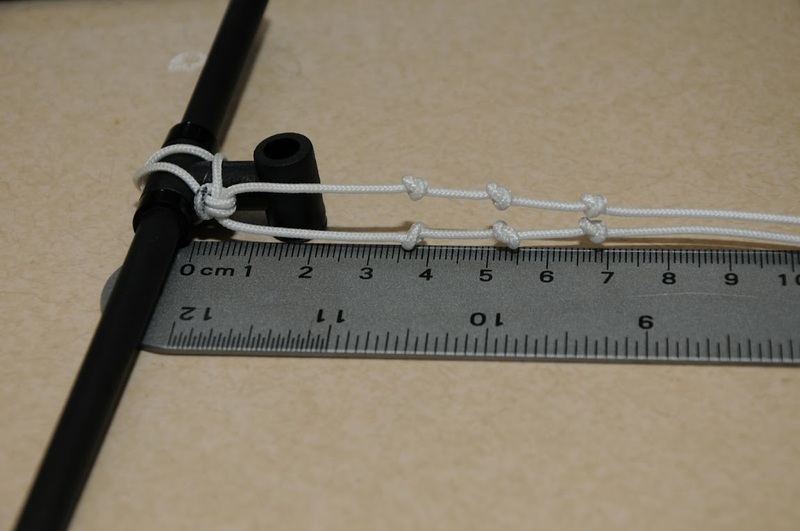 What I've done is figured out that a prusik knot also takes 1.5cm of extra length. 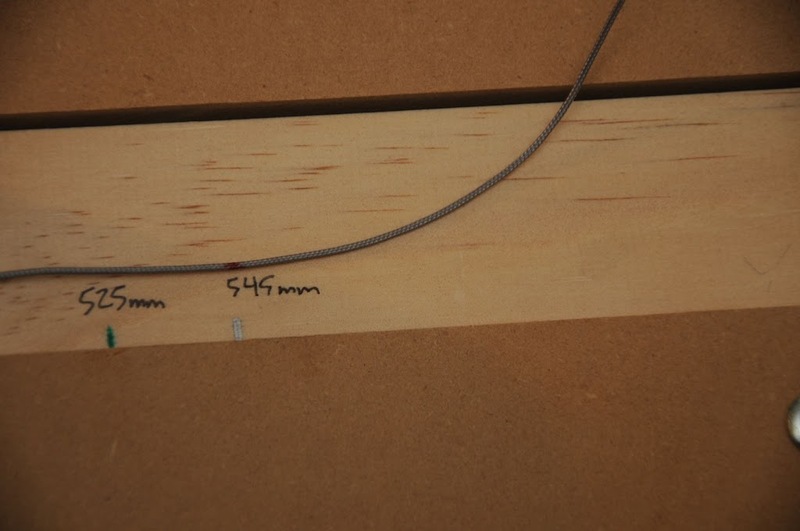 So I added one more mark on the template and a note that states "loose 3cm for prusik knot" that is to indicate that I need to loosen the line by 3cm. so, I've added another mark to the line 3cm closer to the spool that will be the spot I fold over. Then, I finish the piece the same as the first... measure out 10cm, make a mark, tie the overhand knot for the loop and cut from the spool, melting back the 5mm portion left past the knot when cutting. Then repeat all the steps in this post for your second activator. Lay them out and make sure they are the same.